When Donatello, Michaelangelo, and Raphael return from the video arcade, they discover that Donatello’s lab is in disarray and that Leonardo is missing. Meanwhile, stuck in the frozen tundra, Krang locates a highly concentrated energy source just outside the city that he believes will be sufficient enough to enable him to blow the entire planet off it’s axis. Thus causing a shift in the Earth’s proximity to the sun that would reverse the entire climate of the planet. While the polar ice caps would melt, thus freeing the Technodrome, it would also cause the city to be plunged into a new ice age, paralyzing it for Krang’s conquest. With the aid of his Hyper Thruster, a contraption large enough to jolt the Earth off of it’s axis, Krang proposes to use the Foot soldiers to transport it to planet’s surface and assemble it while Shredder and Krang locate the mysterious energy source. 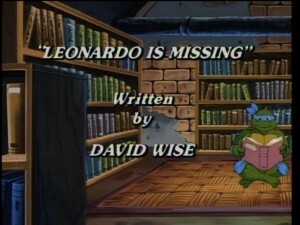 While out on the streets, still searching for Leonardo, the Turtles discover a break-in at the Blow Hard bubble gum factory and decide to investigate. Inside, they learn that someone is stealing baseball cards and they decide that they owe it to the Youth of America to do something about it. Of course that someone turns out to be two someones, Bebop and Rocksteady. After kicking the Turtles’ collective butts, they learn that one of the Turtles is missing and return to the Technodrome to inform Shredder. Using Krang’s holographic cloaker, shredder turns Bebop into a bogus Leonardo and sends him back to the planet’s surface to distract and confuse the real Turtles who are desperately searching for the real Leonardo. 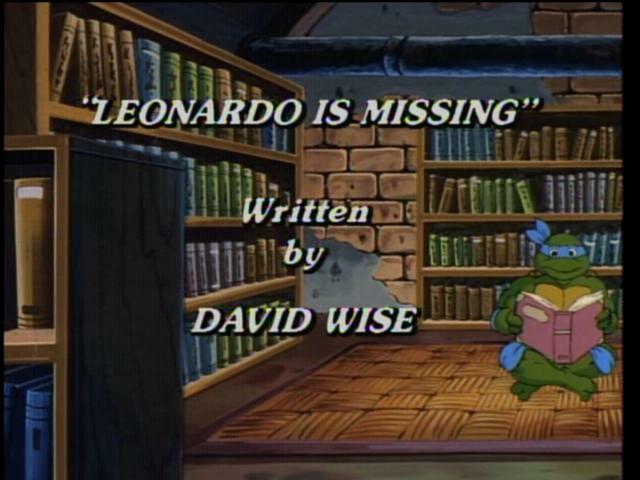 While down in the sewers, the real Leonardo is traversing the underground tunnels with one of Donatello’s tracking devices, searching for the source of the distress signal he received while the Turtles were at the video arcade, and heading outside the city. Back at the lair, Splinter suggest that they all hold hands and try to contact the sprit of Leonardo, but when they do, they receive a vision of three dinosaurs! Meanwhile, the bogus Leonardo (Bebop) is terrorizing the entire city! Over at the gravel pit at the edge of town, Krang and Shredder discover the source of the mysterious energy, an alien craft that burrowed its way up from the center of the Earth. Michaelangelo, Raphael, and Donatello finally caught up with the bogus Leonardo just as the hologram is wearing off. Within minutes, Bebop and Rocksteady spill the beans telling the Turtles about Krang and Shredderâs plan to rock the Earth off its axis and where they can be found. But when the Turtles arrive at the gravel pit, they encounter the same three dinosaurs from the vision they shared with Master Splinter back at the lair. Preparing to defend them, Michaelangelo arrives to introduce them to his new friends. It seems that SPEEGA, the dinosaur leader, and his comrades are descendants of a group of dinosaurs that escaped extinction millions of years ago by escaping to the center of the Earth. The dino survivors have been on a mission to save endangered species every since. While on just such a mission they damaged their craft and sent out a distress signal that Leonardo picked up on Donatello’s equipment. The rest is history. That is until they learn that Shredder and Krang have stolen the dinosaur’s energy cells. Thanks to Bebop and Rocksteady, the Turtles know exactly where to find them. And with the help of the Speega and his fellow dinosaurs, they successfully foil Krang’s seemingly foolproof plan to conquer the earth.